Let’s discuss the basics of investing in the retail apparel sector. Investing in apparel stocks is much tougher than simply buying shares of your favorite retailer. The retail apparel sector is shaped by plunging price expectations, fickle consumer tastes, the rise of e-commerce, and currency fluctuations. Let's discuss where these trends are headed, and which stocks investors should watch to gauge the industry's health. Two key trends define the retail apparel market today: people buy lots of clothing every year, but the amount they're willing to pay per item has plummeted. From 1900 to 2003, the percentage of an average American household's income spent on apparel declined from 14% to 4%. Yet Americans now buy an average of 68 garments per year -- an all-time high that represents more than one piece of clothing purchased each week. Two factors caused this. First, garment production gradually moved abroad after World War II. Once that happened, consumer price expectations were flattened by mutual competition. Once Americans got a taste for cheap fashion, clothes became disposable. According to Elizabeth Cline's Overdressed: The Shockingly High Cost of Cheap Fashion, it only takes Spanish retailer Zara two weeks to design, produce, deliver, display, and possibly sell a garment. Stores like H&M have lowered price expectations. Source: H&M. As a result, apparel retailers that can sell cheap clothes and rotate styles quickly -- think H&M, Forever 21, and Zara -- are outperforming pricier and slower-moving rivals like Abercrombie & Fitch (NYSE:ANF). Selling pricier apparel and rotating styles slowly is a terrible combination for attracting fickle teen customers with limited budgets. 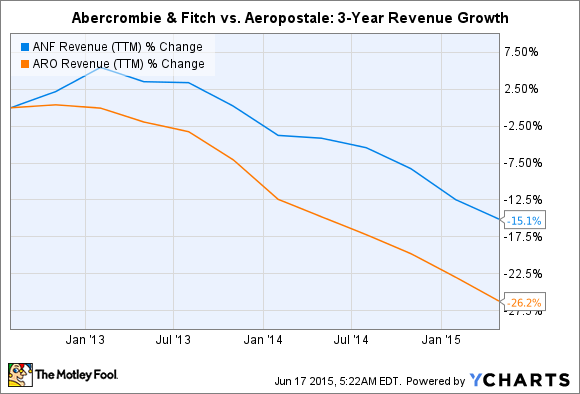 That's why teen-apparel retailers Abercrombie & Fitch and Aeropostale (NASDAQOTH:AROPQ) have been crushed over the past several years. Gap (NYSE:GPS) traditionally fared better than A&F and Aeropostale because it used a tiered pricing strategy -- Old Navy was its low-end play, its namesake stores catered to mid-range consumers, and Banana Republic was its premium play. As a result, Old Navy sales would generally rise during economic slowdowns, while Banana Republic benefited from increasing disposable income. To shore up its defenses against "cheap chic" players such as H&M and Forever 21, Gap hired former H&M designer Rebekka Bay in late 2012 to launch new styles. But Gap disapproved of Bay's minimalist styles and fired her earlier this year. The entire effort was fairly futile, since Gap continued to lose customers to those low-end rivals. Last quarter, Gap reported a 10% year over year drop in same-store sales and an 8% decline in earnings. Old Navy was the only business segment to report positive comp growth, reflecting declining price expectations across the market. Shortly afterward, Gap announced that it would close 175 of its 675 Gap stores in North America. Gap shuttered those stores to increase its focus on online sales, which haven't been hit as hard as its companywide comps. Last quarter, Gap's online sales declined 2% annually and accounted for 43% of its top line. This shift toward e-commerce is occurring across the retail apparel sector: According to eMarketer, online sales of apparel and accessories in the U.S. will likely surge from $52 billion in 2014 to $86 billion in 2018. In addition to nurturing e-commerce growth, apparel retailers must be wary of a strong dollar. For retailers with international operations, sales generated by foreign stores now aren't worth as much when translated back into dollars. That's bad news for companies such as Gap and Abercrombie & Fitch, which are expanding into Asia and other growing markets. Faced with all those challenges, investors might be discouraged from investing in apparel stocks altogether. However, there are a few solid stocks in this sector which shouldn't be ignored. I would recommend that investors keep an eye on (but not necessarily buy) Urban Outfitters (NASDAQ:URBN). Urban Outfitters' dresses. Source: Urban Outfitters. Urban Outfitters, which also owns Anthropologie and Free People, has carved out three defined niches in the market. Its namesake stores sell kitschy, ironic, and humorous apparel. Anthropologie is a trendier female brand that also sells gifts and beauty products, while Free People sells apparel aimed at younger female shoppers. Last quarter, Urban posted 5% comp growth, Anthropologie logged 1% growth, and Free People reported a 17% gain. The downside is that gross margin came in at just 33.3%, down from 34.8% a year earlier, causing net income to slip 12.5%. The company certainly isn't immune to the pricing pressures weighing down the sector, but at least it's keeping its comps positive. Looking ahead, Moody's expects a few positive catalysts to get apparel stocks back on track. Declining cotton prices and ramped-up online operations are expected to lift some retailers' bottom lines. However, investors should be aware that the "cheap chic" effect and a strong dollar could nullify those benefits, so do your due diligence before investing in the retail apparel sector.